Happy birthday to young Kay, fourteen today. Seen above kite flying in Welsh Wales a couple of months ago. A large kite was amongst her presents from us today. I have many lovely closer up photos of Kay but none that she is satisfied with so, sorry, but I won't be posting them for the while. Two posts in one day? And I bet know one is reading today anyway....pah! You may remeber the first time I sold a picture to one of the UK Daily papers...I naively believed that the details the agency had sent me were corect and that I could therefore see my photo in print. But no, the photo had acutally been used weeks before and the date I was given was actually the date the paper had self-invoiced the photo. So now when I get notification of a newspaper sale I'm less excited as I know I've missed actually seeing it in print. 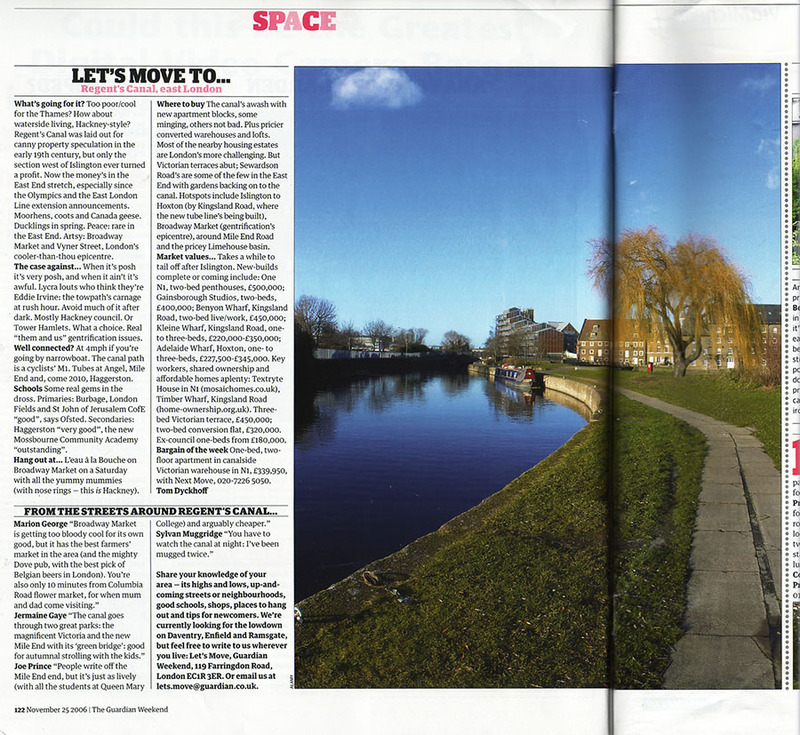 So imagine my delight today as I slowly leafed through the Grauniad Weekend magazine to come across a lovely colourful picture of the canal down near Three Mills Island in their "Let's move to..." section. "That's a nice picture," I thought, "Hang-on, that's my picture!" Sadly the credit is merely to Alamy, than Alamy/Nic Hamilton (which has naughtily been the habbit of late) but at least I got to see it. It will be interesting to see how long it is before I get notification that it has been sold. UPDATE: As requested, scan of article with my picture here (warning 283K file). Or the online version (without picture) here. So yes, it was indeed an upside down cow in Czech colours. Part of the Cow Parade in Prague back in 2004. I know there have also been Cow Parades in Geneva, Edinburgh and (as Kaz tells us) in Manchester. Why not one in London? I shall be writing to Ken ASAP to demand our very own Cow Parade. How long they'd last en Londres without being graffitied, burnt, poisoned or blown up is anyone's guess but I do think they're a lovely idea. There were a couple of hundred in Prague I think, finding as many as possible was part of our weekend there. My favourite was one coated in coffee beans outside a coffee shop which emitted a delicious aroma. A brief selection of some of my photos of the Praha ones here. Full listing here on the official site. OK, we've zoomed out and up a bit. OK, so another one. This is from my archive but I don't think I showed it to you before...any ideas before I give some clues? What and where? Well, I had plans to slowly zoom out and give you a few more clues but Tim has already guessed correctly that yesterday's shot was indeed taken last week while HMS Illustrious visited Greenwich. As soon as I saw the brightly coloured umbrellas in the grey weather aboard the grey aircraft carrier walking up the flight ramp I frantically started changing lens from wide angle to telephoto to get a shot of the visitors standing atop the ramp. I think it's my favourite shot from the day. There were two shots I wanted to get when I heard that Illustrious was in Greenwich. Firstly I wanted a shot with the towers of Canary Wharf in the background. Half managed that one but not quite what I was after. The second shot was a complete failure, you can just about see the Cutty Sark as well as Illustrious but the positioning is not right. I planned to return the next day to try and get shots as Illustrious left but someone had already nicked it.....should have guessed really as they'd already had the rear of this Merlin helicopter when I was there. That's what happens when you park in South East London and invite the locals on board I suppose. Another message from the locals here. Thanks to all for joining in the guessing game. Witchy has been posting photos of her recent Norvern hols (which she claims aren't of the Mission Control Centre Houston) and allowing us to guess where they were taken. I thought I'd even things up for those who haven't been to the North of Engerland recently with some well known places in the South East. Or London even. ..and no checking the Exif info for GPS information! I love Spitfires... there was a day as a young Airfix modeller when I preferred Hurricanes, just to be different from everyone else I suspect, but ever since a school fete sometime in the late seventies when we had a fly-past that included a Spitfire I've been totally transfixed. The first photo I have is from 1999 when we took the girls up to Duxford Aerodrome for a day out. It was the weekend before an air show and there was a single Spitfire flying around in rehearsal for the next weekend. It's the picture that's been up in my masthead since the beginning and which appears in my random photos over to the left now and again (I really must update that selection with some newer ones!). I still like the aged effect I put on it though in truth it's there half to cover the grain and dirt on the original negative. Negatives... remember them? I've been meaning to back to Duxford every time I see there are Spitfires flying at an air show but didn't actually manage it until last month when they had eight. With a promise to get all in the air at once. When I arrived they were still on the ground but even that was spooky seeing them in a line Battle of Britain style. Wandering around Duxford waiting for the flying to start I came across the V1. The Doodlebug that my mother had told me about when I was younger. She'd tell of how as a child they'd look up to see them flying over (she lived on the Kent coast at the time) hoping that they wouldn't hear the engine stop as that meant the craft would start to descend and then explode upon impact. Even more chillingly, she was telling the girls, after seeing this latest photo, of how during air-raids they used to hide in their under stairs cupboard and how on one occasion they emerged to find the front of the house missing. A V1 had taken the front of their house off. When my mother used to tell me this story when I was a kid it was just ancient history to me. Even though at that time it was just 25 years ago. So more recent history then than punk is to me today. So just yesterday then. My mother as a child in a cupboard under the stairs while a German V1 rocket blew the front of her house off. Both my parents looked at the pictures of the Spitfires, the Hurricane, the Mustang and even the Flying Fortress recalling seeing them overhead sometimes in dogfights and my father then further recounted working on some of the planes when he was doing his National Service in the air force after the war. Anyway, before we got to the Spitfires flying we had a few other treats in store. The Red Arrows being somewhere else presumably, we had the French version, the Patrouille de France. I will make no comments about similarities to their flying and driving en Paris other than to say that their display was amazing but they must all be bloody mad. The ballet of the single Chinook has to be seen to be appreciated. If someone were to tell me that I could be so impressed I would not have believed them. I did not know helicopters could do that sort of thing without falling out of the sky. This was followed by some Belgians. Well, exactly. First a Belgian F16. Quite possibly the Belgian F16. He flew past fast. Then he flew past very slowly at a weird angle as though he were screaming to a halt in a cartoon which was somehow more frightening. Then a Spitfire just to keep us all on tenterhooks. Then another Belgian did a display in a pretty red plane called a Fouga Magister. To me his best bit was the take-off in which he raised his undercarriage while apparently still on the runway but carried on level whilst flying at about two feet off the ground. Then some more helicopter dancing... this time the Black Cats (though I though he said the Black Caps).. a naval display team comprising a couple of Lynx helicopters flying much too close to one another IMHO. Then the Hurricane (hurrah!) and finally the Spitfires start taking off until we have all eight in the air. 'twas everything I'd hoped for and more to see them. Wonderful and I really don't know why. Something to do with the history? Or the tales from my parents or the boyhood dreams of flying? Don't know. Anyway, since it is the 11th of the 11th we're supposed to remember. And I do. Was it a different war that time? Or is it just perspective? I'm not sure. But I am glad I don't have similar hiding under the stairs stories from my youth to tell the girls and that they probably won't have any to tell their kids. Is part of the reason for that the "ultimate sacrifice" that so many made? I suspect it has a lot to do with it but it's a crying shame that there are still a lot of wars going on elsewhere that others will be recounting to their children and grandchildren. All the pictures linked above and more besides here in the slideshow. Oh, and the first picture of a Seaking helicopter is included as this is the military version of the Helicopter we flew to the Scillies in. I've ben transfixed by this bridge for a while now.... I've seen it from a small distance when driving near London City Airport. Then it featured in one of the earlier episodes of the current series of Spooks (Adam met Roz here on a misty morning when she was still the enemy.... I think). Speaking of Spooks... where do they go next? They've had Al-Quaeda, Israeli secret agents pretending to be Al-Quaeda and then militant Christians killing muslims to stir up trouble. I assume they're trying to keep it balanced by involving all faiths in terrorism but at this rate how long before someone sues them for not associating their religion with terrorism. Anyway, nice bridge, isn't it? I don't like man-made heights but did feel the need to cross this one (walking very purposefully down the middle) and didn't fall off! Right, those sensible types watching in Fireyfox should be seeing the title as intended.... that is, "I ache therefore I am" but with the therefore symbol instead of text. Cave-dwellers still stuck on IE 6 (I haven't checked 7) may well be reading it as "I ache square I am".....which is clearly nonsense, even here at Planarchy. Why can't IE6 read the HTML coding for the therefore symbol properly (those three little dots)? Don't know, look on the web if you're interested. Actually the original title was going to be "Don't Climb on Anchors". I climbed on this one (which is about ten feet tall) in an attempt to get a better vantage point for a photo and promptly fell off. Luckily I had my bag on my back which broke my fall... but I still have an aching back, head, shoulder and leg. I need some more bionic bits. In my old job we had things called Job Safety Assessments. Before we attempted any task we were supposed to assess the possible risks. I didn't carry out a JSA before climbing the anchor. I should have.